Are you after a backup software, that simply backs up your files and folders? Do you want to have a backup that is a used in conjunction with what you already have? Do you need to be able to quickly access to your backed up data? Answered yes to all of the above questions? Then you are looking in the right place. With Carbon Copy Cloner (CCC), it will clone what you want and when you want. It can backup the entire system or it can be used for selected files and folders. This software gives you the peace of mind knowing that should something go wrong, there will always be a copy. Due to CCC being a backup solution, it allows you to restore a required file quickly. Thus potentially decreasing downtime. 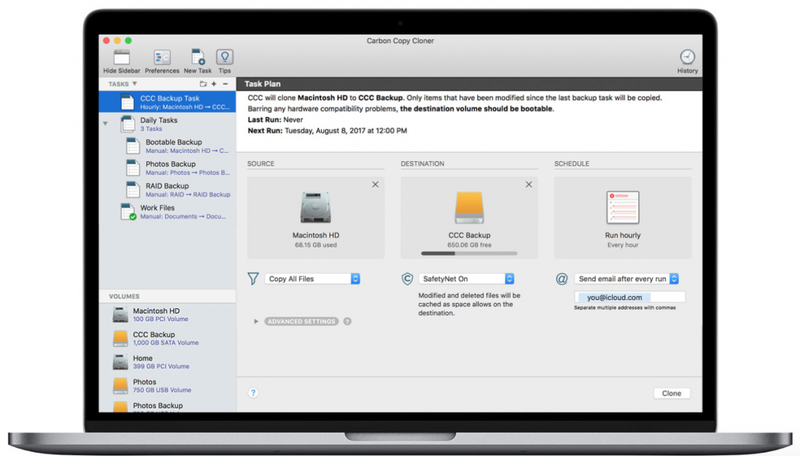 CCC is also a great option for when you wish to deploy a backup in conjunction with your primary source for syncing or backing up. CCC is a low cost and easy to manage software, with a simple web interface, and having a handy tips feature. It is fully compatible with macOS High Sierra and APFS (Apple File System). It can backup onto an external drive or to a networked drive, you can choose. The software keeps you posted on the results of the backup tasks. This is through the macOS Notification Centre. As it is a cloning software, CCC does not allow room for incremental change. This means that it doesn’t recognise errors. Essentially, it will clone any and all errors across to the backup as well. Best used alongside your primary sync or incremental backup software. Can’t compress data. With data compression, it can save up on vital storage space on your external drive. It literally and simply makes copies of your data. At Mac Aid, we like to make sure that this is the best solution for you and your business. Because we know that every business is different and, that every business operates differently. By contacting Mac Aid, one of our engineers will be able to visit you at your place of work and review your needs.